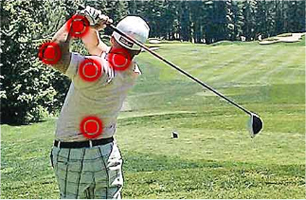 The swinging motion in golf can cause significant stress on the body over time. Shoulder, elbow, back and wrist injuries are all fairly common. 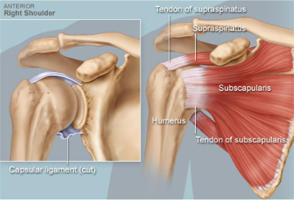 The rotator cuff consists of four muscles that connect from thescapula to the humerus bone and form a cuff around the ball and socket. These muscles help the ball move on the socket, but also compress the ball into the socket to maintain a stable fulcrum for rotation when the shoulder moves. If the RC is over-stressed it will tear, similar to a rope fraying. If having pain while taking full swings over the lateral part of the shoulder may indicate a problem with the rotator cuff. Physical therapy treatment including stretching and strengthening of the affectedmuscles and tendons may help. Oral anti-inflammatory medicationsuch as Ibuprofen, Advil, etc.may also be recommended. An ultrasound guided steroid injection may also be helpful. If the tear is too severe or gets worse surgery is necessary. Operative treatments generally involve a repair of torn tendons and removal of bone spurs. If there is substantial arthritis or an un-repairable rotator cuff tear, a shoulder replacement may be indicated. 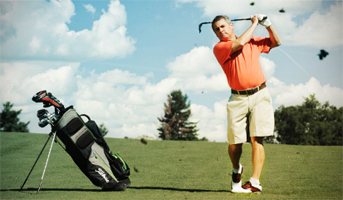 Patients with shoulder replacements can continue playing golf (see below). 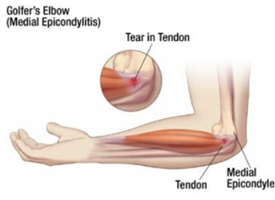 Also called medial epicondylitis, golfer’s elbow is an inflammation of the tendons in the forearm. These tendons attach the forearm muscles to the inside of the bone at the elbow. The repeated swinging motion can strain the tendon, causing it to become inflamed or even tear. This createspain and tenderness on the inside of the elbow. Squeeze a tennis ball for 5 minutes at a time to strengthen your forearm muscles. Use a lightweight dumbbell to do wrist curls: lower the weight to the end of your fingers and then curl back into your palm. Then continue the curl up your wrist to lift the weight an inch or two higher. Perform 10 and repeat with the other arm. Use a lightweight dumbbell to do reverse wrist curls by placing hands in front of you, palm side down. Using the wrist, life the weight up and down. Be sure to limit the motion to just your forearm by holding the arm you are strengthening above your elbow with your other hand. Perform 10 and repeat with the other arm. Patients can play with this joint replacement when cleared by their surgeon. Patients should strengthen the remaining rotator cuff tendons to substitute for torn tendonsincluding the use of elastic resistance bandexercises.